"Special Backer Edition" available with $60 backing. 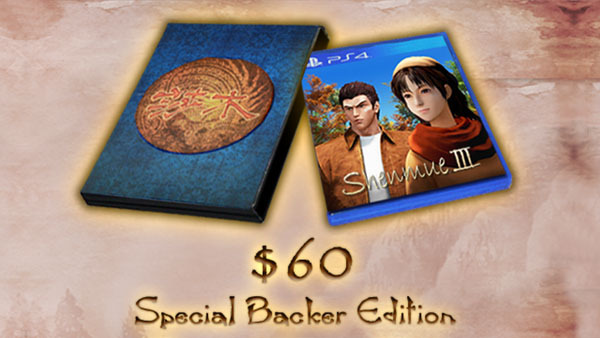 The Shenmue III Kickstarter campaign has added a PlayStation 4 physical copy reward. All backers pledging for a $60 reward tier or higher will have the option of a “Special Backer Edition” physical copy for PlayStation 4. Users will be sent a survey after the Kickstarter finishes to choose whether they want the PS4 physical copy, PS4 digital copy, PC physical copy, or PC digital copy. If you’ve already pledged for a PC physical copy will not need to adjust their rewards if they prefer a PlayStation 4 physical copy instead. Shenmue III can be funded at Kickstarter.